• Brandi: After keeping interest rates low to help the economy recover after the 2008 Great Recession, the Federal Reserve began hiking interest rates in December 2015, and both short-term and long-term interest rates have since been on the rise. During the past year, shorter-term rates have been rising faster than longer-term rates, causing the yield curve to flatten over the past year (measured by the spread between the 10-year and 2-year Treasury yields). This has sparked concerns among investors about a heighten risk of recession, but the reality is that what’s happening is the ongoing “normalization” of policy by the Fed. While there is no impending economic doom, the Fed’s tightening of monetary policy, along with other factors that are part of a late-stage economic and market cycle, are likely to keep volatility elevated. While every investor is different, periods of volatility can be a wake-up call to make sure your portfolio is adequately diversified based on your goals and risk tolerance. Investors who are focused on long-term goals shouldn’t let short-term movement sway their decisions, while investors who are nearing or in retirement may need to add defensive assets, such as cash or U.S. Treasury securities, for stability. It’s important to stay true to your financial plan and make decisions based on your goals and timetable, regardless of market volatility. • Frigon: The yield curve flattening does not assure a recession is on the way. Since the 2008 financial crisis, every year around this time the financial punditry predicts a recession, but each year it fails to occur. This year the streak continues. If anything, we would suggest that the economy may finally accelerate beyond the weak growth it has been experiencing since the 2008-9 financial crisis given the reduction in both corporate tax rates and regulation of businesses, which had been an economic drag over the last 15 years. • Harris: Mainstream media has picked up the story for the “shape of the curve” and its impact on the economy. Simply, it’s all about the Fed – the yield curve typically steepens when the Fed is easing, and it flattens when the Fed is tightening. We are less concerned about the shape and more concerned about the impact rising rates can have on the debt-service costs on a heavily indebted economy. The nonfinancial debt load (mortgages, consumer, business, and US Treasuries) has surged from $27T at the peak of the last credit bubble to $50T today. The flattening generally means the Fed is getting close to the neutral rate of interest rates where central bank policy is no longer accommodative and perhaps even achieving an equilibrium state. The real concern is when the curve actual inverts, becomes downward sloping and stays there, this condition has preceded the last seven recessions and as a general rule suggest the cycle is turning over. In our view, the economy is likely in the early-late cycle phase with some runway ahead before the next recession. At this point, the Fed isn’t tightening per se but rather simply normalizing policy, moving away from extraordinarily easy conditions that lingered too long from the last recession. No doubt, there are issues surfacing such as stress in auto loans, student debt, credit cards, and poorer quality bonds which need to be refinanced at higher rates in the next few years. There will be a shakeout in these markets and funding won’t be as available as in the past during zero rates and quantitative easing. However, there are still plenty of indicators suggesting the end of cycle dynamics haven’t quite arrived yet such as tight credit spreads, steady employment and wage gains, confidence indicators near all-time highs, capital investment spending inflecting higher, banks overcapitalized and ready to lend, and not to mention the enormous benefits from tax reform, government spending and de-regulation efforts poised to spur the economy above trend. • Madlem: The yield curve has been narrowing, and inverted curves can herald an approaching recession, or at least a perceptible slowdown. However, narrowing alone is not a reliable signal. Remember the mid-1990s when such a movement marked not a recession, but the onset of several years of brisk real growth. Context is everything. There is little of concern lurking in the present shape of the yield curve. Aside from the slope the current +50BP margin in the closely-watched 10-year less 2-year Treasury spread is a far cry from inverted. Fed policy is massively different now compared to past episodes that did lead to recession. Normally, when the curve narrowed sharply or inverted, the Fed was clearly tight and growing more restrictive, usually to check rising inflation pressures. Even in Great Recession, which was triggered by a collapsing bubble, not rising consumer prices, Fed policy was clearly neutral, i.e., a funds target rate of 5¼ percent by 2007. Now, even uber-doves concede that, at 1¾%, the funds target remains accommodative. Assuming that Powell and Company do pick up the pace of rate hikes to +100BP per year, that would still be historically very modest for a tightening arc. In contrast, Greenspan raised the funds target by a full +300BP in a year in 1994-95, including +75BP in a single step. The FOMC is signaling it will remain committed to its gradual tightening, for good or ill. Inflation is picking up, but it remains well-anchored in historical terms. For the medium-term forecast, however, the key is what the Fed will do, not what it should do. Given this policy outlook and what appear to be solid tailwinds behind the economy, a recession is not in the cards – for a while at least. • Madlem: The biggest opportunities for equity investors are tied to the global expansion and the U.S. tax overhaul. We see earnings growth as the biggest return driver globally and, therefore, favor U.S. equities over developed market peers. The groundwork has been laid for an upswing in business spending with the lion’s share going toward technology. We continue to see upside to 2018 tech earnings as companies upgrade their platforms. Hardware providers may have a leg up as their products now qualify for immediate expensing. Increased capex in developed markets also has an outsized impact on EM growth, which strengthens our conviction on EM equities. Tech and EM aside, there is a reluctance among some U.S. large caps to spend big. Many companies will emphasize share buybacks. High-yielding stocks, or “bond proxies,” have tended to outperform in most economic downturns but that will not be the case today for two key reasons: 1) Bond proxies, other “stable” dividend stocks and min-volatility strategies tend to play poor defense when rates are rising, and 2) higher rates mean they face competition from bonds for the first time since the financial crisis. Nominal yields have caught up with dividend yields, and real yields are closing in. Putting dollar weakness aside, commodities have historically performed better in later parts of the economic cycle as demand outpaces supply. We see commodities benefiting from the global expansion and prefer commodity-linked equities and debt over the actual commodities. As U.S. rates rise, short-maturity bonds offer enough income to offset inflation for the first time in years. Not in confirmed bear mode yet, we will need to see higher European yields in order to push U.S. bonds over. Higher European yields can only happen with increased concerns over global inflation. If the FOMC hikes rates three times in 2018, consistent with its dot plot, and German 10-year yields rise by 30 bps, fair value for the 10-year Treasury would rise to 2.70 percent. At present, the Bund is 9 bps higher than the start of the year, at 0.57 percent. Given the potential for cyclically higher inflation, we like short-maturity and floating rate bonds. Municipal investors should consider floating rate notes as a tax-efficient way to address rising rates. We also employ TIPS and remain overweight U.S. investment grade. We’ve taken our gains in the high yield sector as this group has weakened relative to investment grade assets. We think that Emerging Market bonds have weakened relative to U.S. investment grade and have taken profits there as well. • Harris: Positioning a portfolio that is consistent with the investment cycle is something that should be on everyone’s mind. Inflationary pressures, rising short-term rates, flattening curves all suggest rebalancing a portfolio under the “late-cycle” investment themes i.e. improving the quality of the portfolio’s holdings (in terms of high-quality balance sheet strength), an allocation to floating rate notes, increasing inflation protection, and reducing highly-sensitive broad-market positions. 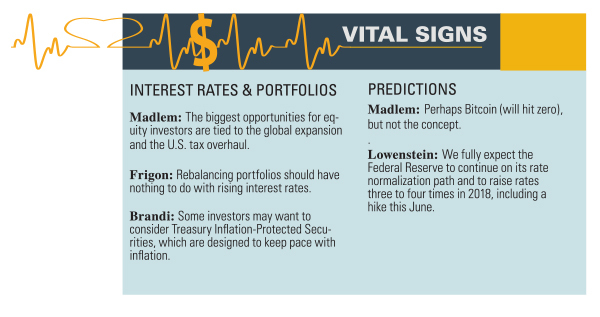 • Frigon: Rebalancing portfolios should have nothing to do with rising interest rates. In a sound investment strategy, the discipline of sticking to rebalancing rules transcends changes in interest rates. If anything, the unfortunate negative side effect of rebalancing is capital gains tax rates. • Brandi: Managing your bond portfolio in an environment with rising interested and increased market volatility can be challenging, but there are a few steps investors can take to help mitigate some of the risks. Some investors may want to consider Treasury Inflation-Protected Securities, or TIPS, which are designed to keep pace with inflation. Some may also want to look into floating-rate notes, which have very-short term durations and year-to-date, have been one of the better-performing parts of the bond market with short-term interest rates moving up. Bond ladders may also help some investors, since they help stagger the maturities of your portfolio over time. • Harris: Currently, the U.S. economy is back to “stall-speed” growth, however, if you were to go back and measure the total market cap of stocks point-to-point since the financial crisis it has grown by $25T, which is equivalent to 5x GDP growth and 25x growth in profits. Certain equity markets are hovering around levels only seen at the highs during pre-recessionary periods. Regarding tax cuts and its impact on households, an increase in rising rates may result in a higher debt-service cost which will eat up most if not all of the tax savings from the recent tax bill. We believed that valuations would compress in this year based on a re-pricing of risk assets given late cycle fatigue and higher inflation and interest rates around the corner. Higher interest rate can have a double barrel negative impact on equities. Competition from higher bond yields draws capital allocation to fixed income away from equities at the margin and the higher discount rates translate into lower equity prices on a net present value basis. On balance, with respect to equity return expectations this year, the powerful beneficial impact of fiscal stimulus is likely going to be dampened significantly by multiple compression and as a consequence, returns will moderate going forward even if the cycle is extended further. • Madlem: “Never believe the CBO,” Lawrence Kudlow declared. “They’re always wrong, especially with regards to tax cuts.” The president’s new top economics advisor and longtime conservative pundit’s complaints about the Congressional Budget Office’s long-term forecasts have some merit. Regardless, there was plenty for the administration to cheer in the CBO’s recent evaluation of the macroeconomic impact of the 2017 Tax Cuts and Jobs Act. CBO concluded that, over the next 10 years, the tax cut would boost real GDP trend growth by +0.7 percent on average. By 2028, this would result in the creation of 1.1 million new jobs and push down the unemployment rate by -0.1 percent relative to levels if there had been no tax cut. The cut in personal tax rates will increase incentives to work, CBO projects. Lower corporate rates will encourage business investment in equipment and nonresidential structures. All these changes will increase productivity somewhat. However, the stimulus will be offset in part by less residential investment as fewer people claim the mortgage interest deduction. Does all this translate into higher stock prices? Markets are grappling with the Federal Reserve rate changes. With the central bank raising rates, P/E ratios have to compress, and that offsets the strong earnings companies are reporting in 1Q — giving us the choppy, directionless stock market of late. Over the summer we expect the stock market’s sector performance will be scrambled with the S&P 500 range-bound to declining through the middle of the third quarter. It’s highly possible that over the summer, defensive sectors (utilities, staples, health care and REITs) will outperform while cyclical sectors lag behind. This scenario would then reverse as we experience the traditional mid-term election year rally. • Brandi: While the economy is still pushing ahead in ways that should support stocks, volatility should remain high this year. Corporate profits are strong, but the expectations bar has been set high and stocks may have already priced in some of that good news. More than ever, investors need to remain disciplined and adhere to some basic, time-tested investing principles, including sticking to a financial plan, focusing on time in the market over timing the market, periodic rebalancing and having a diversified portfolio. It’s important for investors to ignore any short-term noise than can distract them from their long-term goals. • Frigon: Stocks have been discounting a more favorable tax structure for some time now and a pause in the advance is warranted. Strong corporate profits will likely continue, however, the market may well mark time as it grapples with higher interest rates. Additionally, the few mega-cap companies that dominate the market indices and are very highly valued now may slow their pace of advance. We believe some of the smaller companies in areas of core technology (as opposed to social networking and application software) will begin to outperform the mega-caps, so opportunities abound for the astute. Company selection becomes ever more crucial. • Frigon: We never make broad market predictions as part of our strategy. Our approach, and the approach we think serves investors best is to make company specific investment decisions. Since we think a transition to core technology — and smaller companies in those spaces — may be happening, there are many opportunities regardless of how the overall market averages perform. • Brandi: At Schwab, you’ll hear us say that we don’t make specific forecasts for major market indices because we don’t have a crystal ball, and in fact, nobody does. We also don’t think it’s very useful for long-term investors who should be following their financial plan. No matter where you are in your financial journey, it’s difficult to make sound decisions without a comprehensive financial plan based on your individual goals and circumstances. From the Fed we expect two to three more rates hikes this year as it tries to get policy back to a more normal setting. The Fed is also reducing its balance sheet, so policy is getting tighter. • Madlem: Once we finish drifting through the typical mid-term election doldrums, our 2018 year-end S&P 500 target is between 2,830 – 2,850 with the differential determined by trade and how corporations allocate their tax savings. The 10-year Treasury yield can be assessed by watching labor. Labor markets, already at “full employment,” will tighten further. Core inflation will trend up – after posting a +2.5 percent annualized increase in 18Q1, the core PCE deflator trend should breach the Fed’s official +2 percent target by this summer. With both sides of its dual mandate satisfied, the FOMC will have no choice but to keep on tightening. We expect four +25BP rate hikes in 2018 (the next one at the June FOMC meeting) and a comparable pace in 2019. Against this backdrop, the 10-year yield has risen some +50BP since late 2017; in recent days, this key Treasury rate cracked the 3 percent mark for the first time in more than four years. Contrary to fears in some corners, these rising long rates are not a threat to the expansion, but are a by-product of a healthy economy. It’s surprising that this uptrend in long rates has emerged somewhat later than expected. We are on a trajectory to hit 4% by the end of 2019. There is a lot of noise in determining long rates, so we may well see some pullback(s) ahead. Nonetheless, the trend in both short and long rates is upward. • Harris: Culturally, Vivid Financial Management does not make short-term forecasts and predictions for various markets. One thing we do believe, however, is when consensus views are deeply entrenched and all in agreement – something else can occur. Excesses are built by everyone being on the same side of the trade. In the end, when the directional shift in sentiment happens, markets can overshoot and form an opposite excess in the other direction. We don’t think Powell is a Yellen clone and the members of the FOMC are much more hawkish than those in the past. This may result in at least three and potentially four rate hikes this year. • Frigon: Bitcoin is part of a major transformation that has significant implications for how we define money. We believe it is here to stay and is a result of the desire for stable money in comparison to “fiat” money issued and manipulated by the major central banks of the world. However, the more significant implication of Bitcoin is to emphasize the use of blockchain technology — and even more important than that, distributed ledger technology — as a new computing architecture that promises to revolutionize the way the internet works and serves to check the centralized power that the hyper-scale data center companies have amassed. The role of Bitcoin as a currency is limited due to its lack of scalability, which leaves it in place as a “store of value” but not as a currency for settlement of accounts since the number of bitcoins is limited. Thus, it cannot provide the ultimate stability that economies crave. And yet, the horse is out of the barn and the many cryptocurrencies that are trying to solve the problem that Satoshi failed to solve (scalability) will eventually succeed. Meanwhile, distributed ledger and the decentralized architecture it encompasses will serve to disrupt the current centralized cloud system that has prevailed for the last decade. • Harris: With proper analysis, one can identify what drives a price of an asset and if you have done a good job, you can determine which direction it will go. With Bitcoin, it’s very challenging to know what’s truly driving the price. Cryptocurrencies could have an amazing utility as they develop, but currently I would say 99.9 percent is speculation. As cryptocurrencies become either a true form of money or an alternative asset with a store of value, I can see how the utility of them could go up. Over the long run I think the way is up, but what happens over the next quarter or two is anyone’s guess. • Lowenstein: To borrow from Winston Churchill, Bitcoin is a riddle, wrapped in a mystery, inside an enigma. 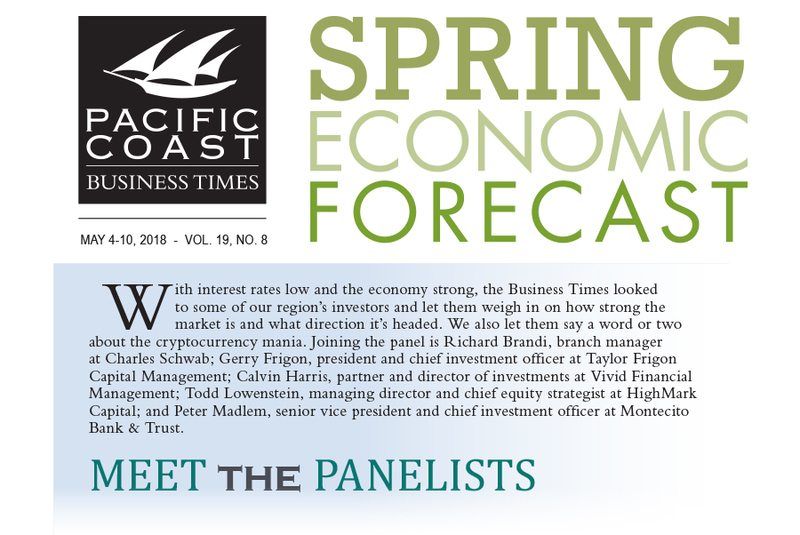 Given its meteoric rise and fall, markets are wondering whether is it a currency, electronic payment system, unique uncorrelated asset class or simply a digital tulip? Without question, the underlying blockchain and distributed ledger technology is real and will likely play a pivotal role in the future for all sorts of applications including as a payment system, supply chain tracking and verifications, establishing property rights in emerging markets and other yet to be determined purposes. The original huge demand for Bitcoin seemed to be based on the notion that widespread government money printing would devalue traditional fiat currencies and therefore there would be interest in alternative assets which better hold their value better without this interference. However, at the end of the day as a currency it is ultimately competing against the government’s ability to print money and control its circulation and when you compete against the government big brother usually wins. The risk of economic activity going underground and the tax base shrinking is too high for governments so they were always going to crack down at some point which they have done on both mining and trading at an increasing rate. Ultimately, it would be reasonable to expect governments and industry to embrace cryptocurrencies so you could see a USD crypto, a Yen crypto and even an Amazon crypto probably with a fixed exchange rate tied to the issuer or other collateral value. The price chart of Bitcoin does track most major historical asset bubbles and busts, it also carries a this time its different narrative like other bubbles when they arrived on the scene. Typically thee bubbles are accompanied by new technology, easy credit and new faith by a certain segments of the population. As always there is a major difference between investing and speculating, the price of Bitcoin seems like pure speculation at this point. • Madlem: Perhaps Bitcoin (will hit zero), but not the concept.